The "Find path" action enable the determination of paths between pairs of nodes in a Logical Regulatory Graph or between pairs of states in a Transition Graph. 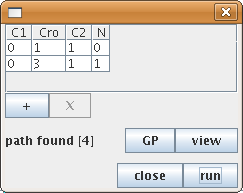 For both graph types, selecting the "Find path" action in the "Graph" menu, opens a configuration dialog box which allows for the specification of the starting node/state, the target node/state, and optional intermediate nodes/states (using the "+" and "-" buttons to add and remove them, respectively). Once the set of nodes/states is defined, selecting "Run" will make GINsim compute the shortest path and highlight it on the corresponding LRG/STG. If several paths exist between these states, the first encountered shortest path is returned. Additionally, a button is available to alternate between the original LRG/STG colors and the computed path. The search tool has found a path from the state 0110 to 0311, involving four steps.